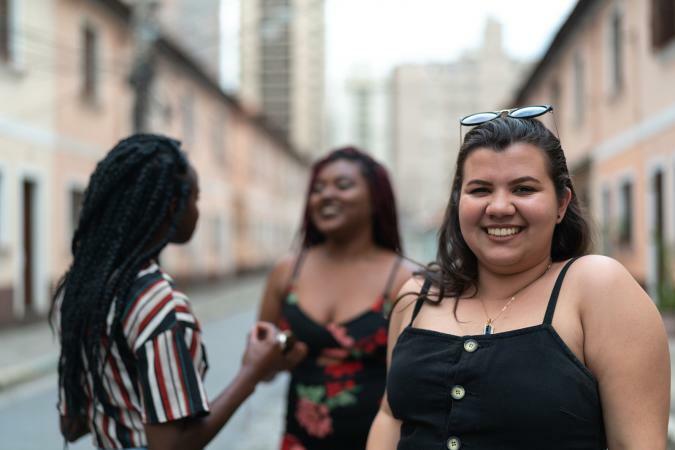 Whether your style tastes run classic or trendy, there are lots of options both online and in brick-and-mortar stores for plus size teens. From flattering dresses to comfortable leggings and cute tops, you can find the clothing you want in the right sizes and styles. Buying online makes shopping a breeze, and many online plus retailers that carry plus size teen fashions today have customer-friendly return policies that make it easy to return clothing items you don't like or that don't fit quite right. Since clothing brands can differ in their specific sizes, take a look at the size charts before you buy. Simply Be offers clothing styles in sizes 8 though 28 in a complete range of fashions from prom dresses to jeans. They focus on providing on-trend fashions, with prices ranging from about $20 to $190, though there are lots of styles available under $50. Sales may offers as much as 30 percent off and the clearance section up tp 75 percent off. Shipping is free on orders over $50, with free returns on all items within 60 days of receipt. Fashion website Vox names Simply Be as one of the best places to shop because of their range of styles for all tastes. Teen girls who like classic looks and vintage styles will love ModCloth, whose plus sizes go up to 4XL. They feature dresses, tops, pants, jumpsuits, swimwear, outerwear and more. Prices range from about $40 to $120, with free ground shipping with orders over $75. Flash sales can help you save 15 percent or more, and they also have an app for easy shopping on the go. Not sure what to wear? Chat with the ModStylists for advice. Returns are free of charge with options for refunds (within 30 days) or exchanges (within 90 days). Exchanges within 30 days get an extra $5 store credit. Rank and Style lists ModCloth as one of the top 10 best plus size clothing stores, praising it for its fun retro fashions. Asos is a retailer that focuses on providing fresh, unique styles in over 30 sizes, including gender-neutral collections and independent designers. They also have ethical trade and sustainability strategies. Clothing costs range from about $24 to $85. Although they are located in the UK, the retailer offers free standard shipping on orders over $49.99 to the U.S., with free returns within 28 days of receiving your order. From party dresses to sweaters to jackets, students can get a 10 percent discount on all products. Asos takes the number one spot on Cosmopolitan's list of best places to shop for curvy girls - the mag points to their consistently offering great looks in both trends and classics. Although Eloquii has several locations in major cities, their website is a popular online destination for plus size fashion. They focus on trendy, contemporary looks in sizes 14 through 28. Find a full range of looks, from feminine maxi dresses to modern tops and leggings. Prices range from about $30 to $150, and while some of the regular prices might be a bit steep for a teen budget, the stores frequently offers sales and coupons, such as 40 percent off original prices or select styles of $25. Free shipping is available for orders of $125 or more, and returns (excluding final sale items) are accepted within 30 days of the date on the receipt. Eloqoii also makes Rank and Style' top 10 list, with reviewers noting it's best for fashion-forward and runway-inspired styles. Sometimes it's just much more convenient to drive downtown to a favorite shopping center for plus size teen clothing, rather than spend the day surfing online. Torrid sells trendy modern clothing in sizes 10 through 30, with dozens of locations throughout the U.S., with locations in malls and outlet shopping centers. With trendy styles for everything from school clothes to date nights, along with activewear, swimwear and even a Fan Girl collection for teens who can't get enough of styles inspired by pop culture, there's something for every curvy teen. Most items range from about $20 to $80. You can also shop online ($6 flat-rate shipping) with returns allowed for items purchased in-store or online within 60 days or purchase. Rainbow operates hundreds of stores across the nation, so there's a good chance you can find one at a mall near you. 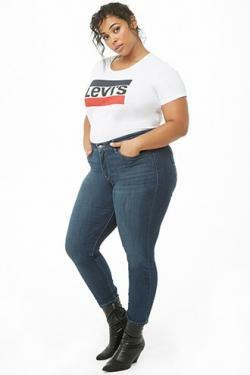 The focus on providing fashionable styles at affordable styles, and while they offer women's and children's clothes, plus size teens will have plenty to browse from in their plus size collections (sizes 16 to 24 or 1-4X). They include top and bottom sets, separates, dresses, lingerie, rompers, and swimwear, with items like graphic tees starting at about $8 and going up to about $25 for things like denim and coats. Shopping online is also available (free shipping over$50) with free in-store returns within 30 days. They also have a layaway program. Popular fashion blog Fat Girl Flow names Rainbow as one of the best affordable shops, listing it as a favorite because of their stylish basics and trendy pieces. Another popular spot that's located in mall throughout America, Forever 21 is also a great place to find trendy clothes that won't break the bank, They offer a full range of sizes in cute dresses, tops, pants, shorts, jackets, hoodies swimwear and more. The prices can vary from about $10 to $70, but there are lots of inexpensive pieces and frequent discounts due to sales. While the styles are cute and modern, some items, like crop tops and ripped denim, are unlikely to meet school dress codes. Buy online as well, with free shipping over $50. In-store purchases can be returned within 30 days of purchase; online returns are accepted within 30 days of the ship date. PopSugar lists Forever 21 as one of the best choices for plus sizes, praising their fun pieces and affordable prices. Also keep in mind that some thrift stores, like Plato's Closet, may carry plus sizes for teens. This is an ideal place to shop if you're on a tight budget or are looking for vintage wear. Another idea to try is your local fabric store. Here you can find a nice selection of plus size patterns that you can alter to your own needs. Or better yet, if you're a whiz at sewing, why not design your own trendy wardrobe? While many argue that the term "plus size" should be done away entirely, many retailers still have sizes they refer to as plus. This can be helpful to indicate sizes, but regardless of the terminology they use, more brands and retailers are offering inclusive sizing, so there are more options to choose from. Today, many of the more traditional styling tips for plus sizes (such as only wearing vertical stripes or sticking to dark colors) are considered outdated, so the best fashion tips include a focus on finding on what feels right to you. Pay attention to the cut, drape, and flow of the fabric. This is often more important than the color pattern in terms of how flattering a piece of clothing is. If it skims over an area you don't want to highlight, but is fitted in a place you're comfortable with, chances are a winner, regardless of whether it follows traditional fashion tips for plus sizes. Clothing should fit your body shape well, no matter what the style is. While many clothing items - like loose tunics, maxi dresses, and drapey asymmetrical sweaters, look beautiful - don't focus solely on loose fashions. The key is to make sure that is fits in a way that is comfortable but also has shape so it looks tailored to your body. For example, girls apple shapes can look great in tops with fitted bands and loose busts, those with pear shapes may find ruffled tops and fitted skirts a flattering combo, and those with straight figures (undefined waists) can benefit from dresses or jumpsuits that are fitted at the waist. Don's shy away from belts. They can work well for any shape. For narrow belts, consider placing them at the narrowest part of the body (for some this may be under the bust). This looks adorable with dresses. Wide belts can look great positioned over the hips (blousing the top fabric a little bit works well with this look) or waist. Look for necklines you love. There are tons of different neckline options, and these can make a big impact on how a dress or top fits. Try on (and don't shy away from ones you haven't before) pieces with different neckline - keyhole, v-neck, asymmetrical, mock or turtle, boat, off-the-shouter, rounded, and so on - to find favorites. Color and patterns can be your friend. Bold patterns and bright colors can look equally beautiful on any size. It's more important to make sure colors work with your hair and skin tone. Dramatic patterns don't necessarily make ladies look larger - in fact, the visual impact, especially in paired patterns (a striped top and floral skirt for example), may do the opposite. These days, there are dozens of great shopping options for plus size teens. With all the choices on the market, there's no need to sacrifice style in an effort to find the perfect size.